Doug Mockett was only too happy to join Historic GP at its inception -- when he started racing his 3 liter Penske PC-3 in the mid-90's, quite often it was the only Formula One car on the grid. "I guess my biggest dubious achievement would be winning the 1998 VARA Formula One class championship where I entered the VARA event at Thunder Hill," says Mockett. "I was the only Formula One car there. I won the event. And nobody ever entered a Formula One car in any VARA event all year long. So I've got this very nice trophy that's kind of a dubious achievement." Now he enjoys running with 30-car grids. "The Historic GP is a grass roots organization of lovers of Formula One cars and owners of them who enjoy spirited gentlemanly competition with them. I think the organization is off to a great start. And I think Steve and Phil and James and Becky have really taken the bull by the horns and have done a great job of organizing and getting it forward in a year. We had a meeting here in my offices a week or so ago with a bunch of the guys and got some really good direction to help find sponsors and a lot of really good input. We're underway and in a really good positive way. The show's exciting and the cars are exciting. It's a great show." Raised in Short Hills, New Jersey (25 miles west of New York City), Mockett's first racing hero was Fangio. Doug attended his first race at nine years old, when his father took him to a race at a board track. "I couldn't believe it, it was just out of sight. It was unreal. They were racing midgets and what you would call jalopies." In his teens and twenties, Mockett helped out local amateur racers, one of whom was Mark Donohue. "Mark Donohue grew up in the town next to mine. 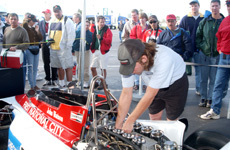 I crewed for him over a couple of seasons in SCCA and really got into it. We had a great time, obviously. He was just a real character. Really great. Just a good guy." Mockett obtained his BA in English from Hobart College in Geneva, New York -- conveniently on the other side of Lake Seneca from Watkins Glen. Hitchhiking down Route 14, Mockett saw his first race at the legendary track in the Fall of 1958. "Joe Bonnier won in a Maserati 250F and I thought I'd died and gone to heaven. It was just unbelievable. 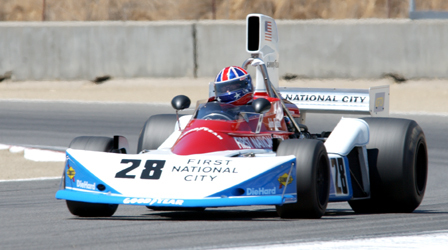 It was a Formula Libre race, so mainly, it was a run what you brung. I remember he had a big dice with Peter Ryan from Canada, who was driving a sports car of some sort. But Bonnier was clearly the class of the field." Growing restless in the Spring of 1968, while he was finishing up his MBA at N.Y.U. and doing advertising and public relations for a brokerage house on Wall Street, Mockett decided to take time off. His two choices were sailing the Caribbean or attending all the Grand Prix races that season. "One night after a few beers, I flipped a coin and the Grand Prix races came up. I've often looked back and wondered what would have happened if the sailing had come up." Serendipitously, soon after the decision of the coin, Mockett landed a racing enthusiast's ultimate job (outside of driving, of course) -- broadcasting Formula One races from Europe for WINS, Group W's (Westinghouse Broadcasting) local affiliate in New York City. An adman from Group W noticed the racing photos and memorabilia in Doug's office and said they were looking for someone to cover racing in Europe that summer. Mockett instantly replied, "I'm your man." "I went up to WINS a couple weeks later and talked to the guy and he told me to write a two minute script and come back and he'd give me an audition. So I wrote a two minute script, went back, had an audition and got the job. It paid $50 a race." No expenses, nothing else, but that was fine with Mockett since he was going to the races anyway. He spent that summer of 1968 in Europe attending all the Formula One events, calling in reports on significant races. "That was kind of cool. 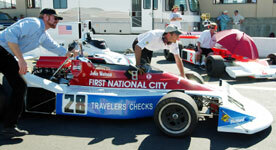 I also covered the races in the U.S. -- CanAm, NASCAR and the Formula One races in Canada and Mexico." The equipment was not very high tech. "Just picked up a phone and called them collect," recalls Mockett. "I'd just call in a report. They'd record it and play it back during the sports." His first impressions of Monaco, Monza, and Nurburgring stick in his mind the most. "Monza didn't have those silly chicanes then -- it was just an unbelievably fast circuit. And Monaco is obviously a classic race circuit, much as Monza is. It was unbelievable, fabulous." Of course, the racers he interviewed also made an impression. "I knew them all. Many of them became good friends. Bruce McLaren and Denny Hulme were very good friends of mine. Denny remained a good friend during all those years. And Bruce as well; Bruce was really a neat guy. There are a couple of great lines from Denny, who was such a low key guy. I was with him after he'd won the world championship (for Brabham) in 1967 and he could have cared less. (He said,) 'Well, my wife's more impressed with it than I am,'" laughs Mockett. "I always thought that was a great line." Mockett describes Jimmy Clark as "a very polite, very shy and quiet guy, just like everybody says." Mockett continued to cover some races sporadically in 1969, and his last race was the 1970 Daytona 500. By then, Mockett says, "My sabbatical was over. Time to go back to work. It was a Walter Mitty thing. I mean, wow, here am I in with all these guys at these big events. How cool is this?" In 1970, Mockett moved from New York to Los Angeles and got a job with Yamaha's ad agency, handling their motorcycle and snowmobile business. "The next thing I knew, I was on a plane to New York to put on a motorcycle race in Madison Square Garden with instructions from the higher ups at Yamaha to 'fill the Garden.'" It kicked off a very successful series of Yamaha sponsored flat track motorcycle races. Mockett continued promotion for Yamaha for a few years, expanding the program to a whole series of races around the United States. Eventually, the ad agency lost the Yamaha account and Mockett was let go, but he landed on his feet, signing on with Yamaha promoting motorcycle and auto racing throughout the 70's. He also freelanced during the off-season, doing occasional races such as the Super Bowl of Motocross at the L.A. Coliseum and the Indycar races at Ontario Motor Speedway. From 1977 to mid 1978, Mockett took a year off from the promotion business to become the czar of the American Motorcycle Association. "I was kind of a dictator, hired to run it with an iron fist. I brought in a bunch of outside sponsors, a bunch of new television deals, and a bunch of new safety stuff. But it was a difficult year. Nobody wanted the improvements, so to speak." Although Mockett had had some hot laps around Sebring courtesy of Peter Gregg's 935 and had ridden bikes around motorcycle tracks, it wasn't until he retired from racing in 1980 (prompted by marriage to wife Sonia and the birth of twin sons) that he actually thought about getting into the cockpit himself. "In all candor, when I was doing all of that motorcycle and car racing stuff, I never really thought of it. I was too busy doing the promotion to think about driving. Then I developed this business (designing and marketing office furniture components) and realized I needed some outlets. Racing was one of the outlets I decided to pursue." 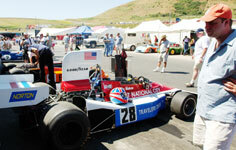 In 1987, Mockett did a Bondurant school, bought a Lotus 18 Formula Jr., and started vintage racing. He won his first race -- a VARA race at Riverside in the Spring of 1987. "I'll never forget it. 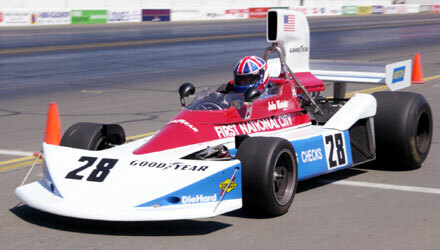 I had no practice in the car and started on the last row of an open wheel race alongside some guy in a Formula 5000 car. 'Oh my God - what am I doing here?' Then a month later, the newsletter comes out and I guess I was the only Formula Jr. -- I ended up winning." He went on to race a variety of other cars, including a Lotus 22, an ex-Paul Newman Ferrari 308, a GRD Formula Atlantic, a Cooper T56 Formula Junior, and an ex-Masten Gregory Cooper T53 Formula One. The Ferrari 308 was the first in the country and a cover car for Road & Track. Newman first started racing it in SCCA in the late 70's for a celebrity team (which included Clint Eastwood and Gene Hackman) put together by San Francisco Ferrari dealer Ray Ramsey. "Newman drove it for a couple of years with varying success. He got a couple of poles, but it didn't have a very good finishing record." Of the Cooper Formula Jr. T56, Mockett says, "It's my favorite car in the whole world." 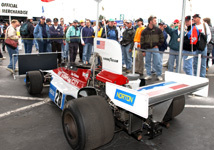 One reason could be that none other than Denny Hulme, ex-Cooper mechanic and driver, helped set it up when he drove it for Doug at the 1991 Monterey Historics. "He came in after practice and qualifying, I'll never forget it, and sat in it for about 20 minutes and didn't move and was just sort of looking straight ahead. I was wondering if he was okay and what exactly was going on here, but he then got the mechanic, Carlo, and gave Carlo about three days' worth of work to do in 24 hours. Basically what he was doing, which was kind of cool, was downloading and processing the entire practice session and figuring out what he needed to do with the car to make it work for him." Denny's first comment when he got out of the car was that all the corner weights were off. Then he proceeded to prove it by lifting the front wheels one by one, exhorting, "Go ahead, lift them. You'll feel the left front weighs about 50 lbs. more than the right. You can feel the weight is transferred over there." Recalls Mockett, "So we're all looking, going, 'Omigod, uh, uh, yeah, okay.' I mean, I didn't know you could lift the front of the car, side by side, and feel the difference in the weight. It never occurred to me, but yeah, you sure could. You just lift up the car wheel by wheel and you can feel it. Of course, I could hardly lift it and he could do it with one hand. It was an eye-opener." Mockett says once they made Denny's changes, they never touched the Cooper after that. "I couldn't believe what a wonderfully handling car it just became. It was real interesting because it showed the difference between us amateur racers and a professional who knows how to set up a car, which I had not a clue how to do. In fact, I really started coming to grips with it after that." Denny finished second to Steve Froines in the event, "Which I felt was neat." 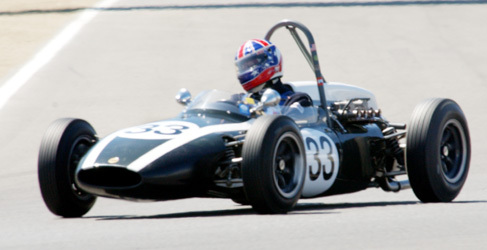 Mockett's 1.5 liter Cooper T-53 Formula One had been run by Lucky Kasner under the Camoredi banner. "I was fortunate to find it and it's special to me because it's the only car racing in Europe in American racing colors -- which are white with a dark blue stripe down the center -- the way it raced initially." In 1994, Mockett moved up to the Penske PC-3. The thing that most attracted him to it was the fact that his 6'1" frame could fit in it. 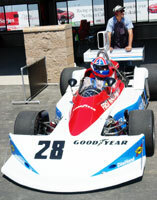 "I looked at a number of Formula One cars and the only two that I fit in were the Shadow and the Penske. Mainly it's the legs, getting my legs to fit. Because I could fit in my shoulders, many of them I could fit in, but the legs wouldn't fit. It was too tight. A friend of mine in England owned the Penske and it seemed like the right thing to buy from him." Though it was running, there were handling problems which took years to sort out. 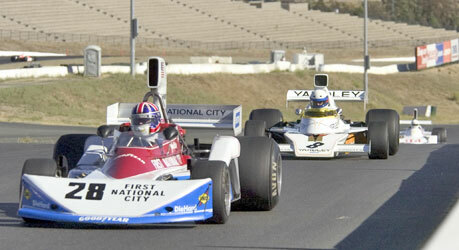 "Fortunately, I found Phil Reilly and he manages any number of F1 cars and really knew how to set them up. He'd driven a bunch of them and he knew what needed to be done. 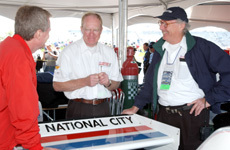 He was instrumental in getting me comfortable with the car." Mockett says it was a big jump to go from the Formula Jr. to the BDA engined Formula Atlantic, but an even bigger jump to go from that to the Penske PC-3 with the DFV motor. "I thought, 'I can't imagine driving something this size with twice the power, which is basically what the DFV motor was -- two BDAs put together. That was a kick, so I really enjoyed it." "It was hard to believe how quickly things happen and how fast. For example, I tested it when I first got it at Willow Springs and I just couldn't believe how quickly the front straight got gobbled up. It was unreal." 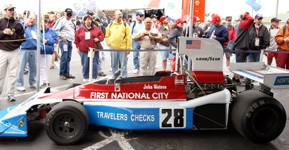 When it ran originally, the Penske qualified for the 1974 U.S. Grand Prix, the last race of the season, but mechanical problems kept it out of the race. 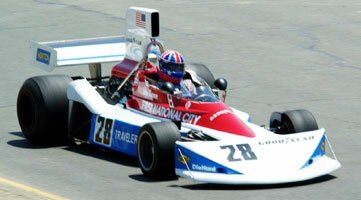 It ran the first five races -- through Monaco -- of 1976, scoring a fifth place in South Africa. "So, it's a points scoring car. Essentially, it was pretty much a mid-pack runner." Interestingly, Mockett's old racing pal Mark Donohue drove a Penske PC-1, finishing 11th in the Canadian GP. 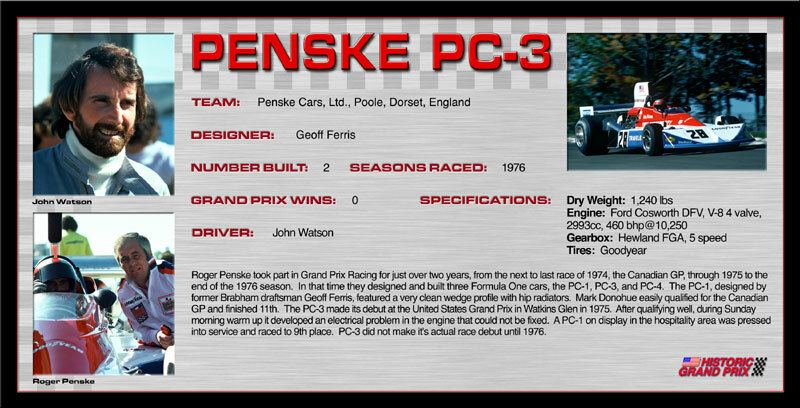 Designed by Geoff Ferris and built by the Penske Team in England, the car has a uniquely Anglo/American heritage -- much like Mockett himself. "My parents were from England and they emigrated here. I'm an American citizen; I was born here. I thought it would be kind of nice to have a helmet that combines both." 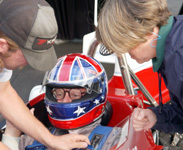 Mockett designed the helmet himself, with the British Union Jack on the top and American stars and stripes gracing the sides. A resident of Rancho Palos Verdes, Mockett has raced all over the world over the past ten years, including New Zealand, Canada, Mexico, England, Belgium, Italy, Czech Republic, Germany, and South Africa. In 1997, he finished fourth in the Cooper Formula Jr. in a historic race in Monaco, the track that impressed him so much nearly 30 years before. 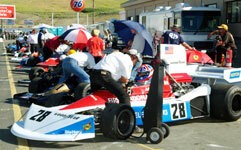 Last year, he finished first in class there (eleventh overall) in the Cooper Formula One. "I got a very nice trophy from Prince Ranier." The last two winters, Mockett has combined races in South Africa with photo safaris in game preserves at Kenya and Kruger National Park in Northern South Africa. "The wild life is spectacular, it's just absolutely incredible. It's not like a zoo. A million animals." Described as "civilized camping," they were surrounded by wild giraffes, lions, zebras, antelopes, and elephants -- and round-the-clock armed guards to chase them away. "The first night we got there, we came back from dinner with this armed guard and right next to our tent there was this elephant munching away on the tree leaves. We got to bed and I'm thinking, 'Oh my God, if this guy has a heart attack and falls the wrong way, we're dead.' You could hear him crunching away right outside, I mean, three feet away. They have the grazers and the predators and they all act out their own roles. We saw a baby wildebeest get born, wobble around on its legs, and then get eaten by a pack of hyenas, all in eight minutes. It was really unreal." But nothing matches the excitement of racing his Penske Formula One. "From a personal point of view, when I watched them race, I could really appreciate the talent required to drive the car. But then when you get in it and actually do it yourself, you can really appreciate the talent required to drive it. The cars are just so awesome to drive. They're clearly, in my mind, beyond the ability of the large number of us driving them, with a few exceptions. I mean, they're unbelievable to drive. They do everything so well and they are so sophisticated. They're awesome."